President Muhammadu Buhari on Wednesday arrived in Maiduguri as part of nationwide visit to trouble areas in the country. The President is billed to visit Yobe to meet with families of 110 school girls abducted by Boko Haram insurgents at Government Girls Science and Technical School, Dapchi, on Feb. 19. 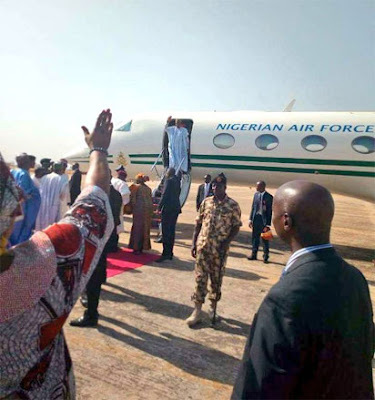 The presidential jet landed at Maiduguri International Airport at about 11.01 am. The President was received by Gov. Kashim Shettima of Borno, Chief of Defence Staff, Gen. Obayomi Olonishakin, National Security Adviser (NSA) Retired Maj.-Gen. Babagana Monguno and other service chiefs. Others were the ministers of Education; Youth and Sports, Interior, and Information and Culture, Mr Adamu Adamu, Solomon Dalong, Abdulrahman Dambazau and Alhaji Lai Mohammed. The President, accompanied by top government functionaries, was expected to board a chopper to Damaturu, the Yobe capital later in the day.